A few months ago I was able to pick-up a few spectrum analyzers at reasonable prices. These were a HP 8591E (1.8 GHz) and an Agilent E4402B (3 GHz); both with tracking generators. The 8591E was in really nice physical condition and worked perfectly. 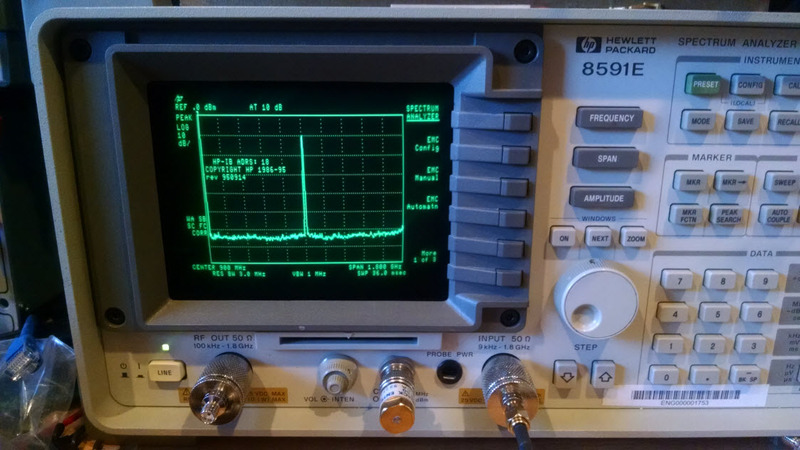 Here is that unit on my bench with a 900 MHz tone shown being driven by my Fluke 6060B RF generator. The E4402B on the other-hand looked a bit more used and was not operational on the receive side, though the tracking generator seemed to be OK. The E4402B was not functional with a steady tone at 800 MHz with no input. The board from China was $1700 and $3000 from Agilent. Fortunately this video by Shahriar over on The Signal Path Blog gave me hope that the problem was an Agilent prescaler part that was directly substituted by a Hittite HMC365S8GE DC-13 GHz prescaler IC. Next will be the RTC/NVRAM module because the unit is 13 years old base on the date of manufacture and the NVRAM battery cell is gone. As a result, the calibration settings cannot be stored and clock settings do not persist across a power cycle. Luckily, Agilent used a STMicro part with an innovative removable crystal and lithium battery module they call SNAPHAT. The 28-pin RTC/SRAM module has 4 female pin sockets as part of the package and the crystal and battery module plugs into and snaps onto the IC. The part number for just the battery unit is M4T28-BR12SH1 and was available via DigiKey. Update (10/15/2014): Just installed the SNAPHAT part in and re-calibrated the unit, set the Date/Time, etc. All good with no more errors or messages – done. This last Saturday morning a post was sent out on the NLRS reflector alerting members to a moving sale. Listed with other items was a Heathkit SB-200. 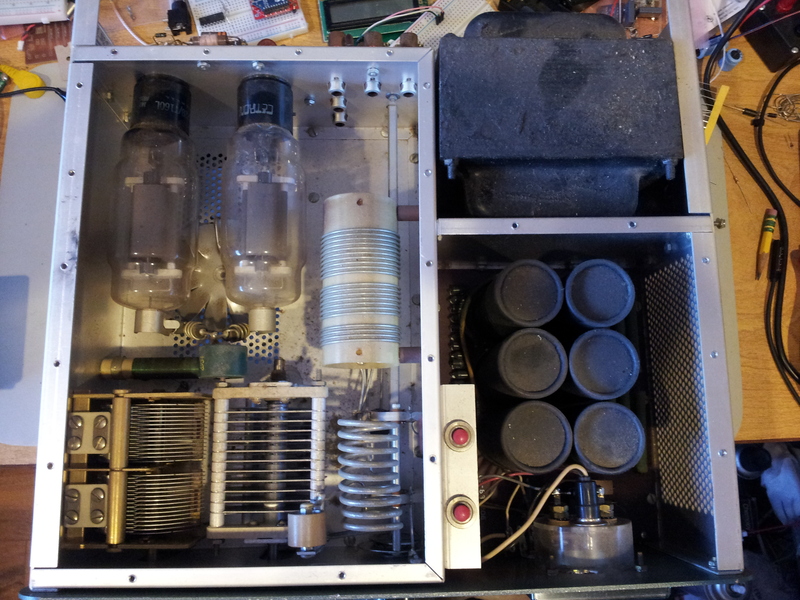 This was the kind of amplifier I was looking for as long as it wasn’t too abused or damaged. As it turned out, it was in fine shape actually, just a bit dusty inside, but nothing excessive. Quite humorously, all of my used HF gear has come via NLRS, which is a VHF and above weak signal club. The unit still had the original Cetron 572B tubes in it, which made it a good find indeed. I contacted the previous owner who informed me that only the supply capacitors had been changed while he owned it. As the picture above shows, this is a clean unit and did not show signs of excessive use. The Ham I purchased the unit from said it had not been on the air for probably 6 years, so I was a bit hesitant to plug it in a fire it up, but if it needed repairs it would certainly show it. Quite fortunately, the unit had no issues when it was switched on. Further, it ended-up producing 300+ watts with about 50 watts in from my Icom 765. There are only 2 noticeable improvements needed up front; the original fan is understandably not very quiet, and both of the doorknob caps probably need to be changed as the tuning ranges on the front panel are pretty far off from what is silk screened. I have to investigate the latter issue a bit as this may not be too far from typical experience for this model. If/when I do some refurbishing, I’ll do some posts on that work. These devices can be thought of as high-current capable zener diodes. A TVS will be rated in terms of it’s reverse breakdown voltage which in practice is the maximum voltage you want to allow before a protection device, like a fuse, kicks-in. You place a TVS shunted across a DC voltage rail with the cathode on the positive voltage rail and the anode connected to the power supply common, or the reverse of this for negative voltage rails. The protection device will normally be in-line (in series) to remove power from the circuit being protected. ON Semiconductor makes a series called the MiniMOSORB line that has impressive current handling capabilities. For example, the SA12A part is capable of limiting the voltage to about 14V and can withstand about 25A of current. So for example, a mobile device powered by 12-13.8 volts can be protected from overvoltage or reversing the supply leads (its still a diode) even though it may be protected by a 15A fuse; i.e. the TVS will present a short and ensure that the fuse is blown. You can find TVS diodes for sale at many supplier web sites and on eBay where sellers like myself have them for sale. In effect, if your circuits cannot tolerate a higher than normal voltage spike that is transient or permanent, caused by a voltage regulation fault for example, then a TVS is a great way to protect the circuit from an overvoltage condition. Sometimes you have a shielded transformer in your scrap box, or have acquired some from a surplus distributor, and you’re not quite sure what you have. Even with a marked, currently stocked part, you may want to more closely examine its frequency characteristics or in-circuit Q factor. There is a very basic way of determining what the intended frequency and passband characteristics were intended to be. For this you will need an oscilloscope and a signal source with a reliably close manual indicator, or a digital frequency display. Ideally the signal source should extend up to 10 or 20 MHz. The idea is to manually dial the frequency adjustment of the generator while driving a sine wave into the primary of the transformer while observing the output across the secondary using the scope display. The transformers commonly found are going to be adjustable slug tuned or fixed, and will have 4-6 connections. Quite commonly, the primary will be a single, un-tapped winding, with the secondary being center-tapped. In the case of balanced modulator or mixer transformers, this may be immaterial because the two windings can or will serve either role. It’s really the application of the transformer that matters if the turns ratio is something other than 1:1, or a center tap is not required, etc. You may want to check what you think is a primary or secondary with an ohmmeter just to be sure, but if the piece is really a single adjustable coil, you’ll soon discover it. Starting at 100 kHz, you increase the frequency of your generator while looking for a peaking effect in the display of the sine wave as seen by the scope across the secondary. If the transformer is broadband, is will be a lower Q transformer that will peak, but very slowly, then decrease in magnitude as you roll pass the center of its passband. If the unit is high Q, and the turns ratio is more than 1:1, you will need to slow your frequency tuning a bit as the peak will be much more sudden as the transformer hits its point of resonance. Note this frequency. If the transformer is slug tuned, try moving the slug up or down and re-check the frequency; you should now see the shift in the passband as a result of this adjustment. Of course if the transformer is not slug tuned, your application circuit may contain a variable capacitor for fine adjustments anyway, or is broadband enough that the isolation across the transformer is all you needed. You can also make careful measurements to determine the turns ratio of the transformer. At HF frequencies, it is reasonable to observe the primary and secondary peak to peak voltage readings on your scope and draw a simple conclusion. If the primary P-P voltage is say 1 volt and the secondary is about 4 volts, you have stepped-up the voltage by a factor of 4, so you have a 1:4 ratio. Likewise, if the P-P voltages are about the same, you can conclude there is a 1:1 ratio. Again, the fixed transformers can be tested in the same manner. Obviously if you have some know parts from Mini-Circuits, or your testing a bi-filar wound toroid for example, then the turns ratio will be known. Testing for Q factor takes a bit more patience and better equipment really; i.e. a scope with cursors that can help you easily find the 3dB point on either side of your transformer. Of course this is not a demanding requirement for a new or used oscilloscope today. Follow the link for a refresher, but to calculate the Q of the transformer, we are going to need to measure its 3dB bandwidth in addition to the center or resonant frequency measurement we made above. The Q then can be calculated by dividing the 1/2 power or 3 dB bandwidth number into the resonant frequency. In this case we are going to use the (0.707 x the peak voltage) method to determine our 3 dB point in terms of voltage. If you use a convenient secondary output P-P voltage value of 1, then you are looking for the points where the voltage comes down to .707 volts P-P.
For example, if you find your transformer peaks at 9 MHz and your 3 dB point spanned 600 kHz, you would calculate a Q of 15. The misty view of the Flea Market early Friday Morning. Hamvention 2013 was again a great place to meet people and find some bargains. There was a Amp Hour meetup that I could not attend, but I did run into Chris Gammell there and we had time to chat in the market. This year I found some nice used SMA jumper cables out in the flea market, and bought some great parts inside in the expo area. I also attended FDIM, and enjoyed that very much; so much I decided to return to FDIM and Hamvention in 2014. I posted this on the Yahoo QRP-tech group as well. Regardless of toner or transfer medium, i.e. paper or plastic film, here’s a simple way to success. Since I already had a $29 B&D Toaster Oven for solder paste re-flow, I decided to preheat the board and then run the board and transfer through the laminator. 1 – Preheat the oven to ~300F/150C. 2 – Turn on the laminator. 3 – If using plastic film, clear or Press-n-Peel, have a piece of cover paper ready. I just cut a sheet of printer paper to mostly cover the board and then folded it about 30% from one end, but the remaining 70% or so should completely cover the plastic transfer film. 4 – I then carefully laid down the transfer onto the board, and used the cover paper to rub over and flatten the film. 5 – While holding the board with pliers, align cover sheet with 70% on top and 30% underneath board and insert into laminator. 6 – One pass through the laminator to flatten under pressure is all that is required. Run board under cold water and peel off film. The cover sheet is just used for the same reason it is when doing badges, which is where the idea came from. It just adds a margin of protection for the laminator and seems to make feeding the board seem easier. The result was 100% coverage for both the paper and film transfer trials. Obviously (duh..) the higher board temperature at the start was key to getting the toner stuck down well. Your mileage will vary, but this was neither cumbersome nor time consuming; especially using plastic film since there is no wash step. You are ready to etch! Below is a close-up of the 3rd test transfer. Very crisp all in all which should produce a fine etch result. I have many more experiments to run before I have a process, but so far the results are promising.